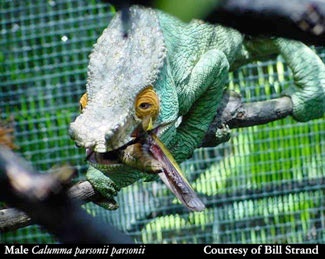 Successful captive breeding by the private sector is essential to the long-term survival of many chameleon species. Key to successful reproduction is the feeding management of gravid females. Part 1 in the previous issue addressed nutritional preparation of pre-breeding females. If you've read anything on breeding chameleons, you've no doubt stumbled upon a sentence such as: "Make sure your chameleon is in good nutritional status prior to breeding". And then the author moves on to other topics. No detail. No photos. Nothing. You're left to wonder just how in the world you're supposed to be assessing nutritional status. First, some definitions. What is good nutritional status? I use it to mean that the female is in positive nitrogen balance, with all the essential and non-essential amino acids she needs for optimal organ and cell function. It means she has fat stores (adipose tissue) in sufficient quantities to sustain her when coelomic egg-fill limits her food intake. It means she has stores of specific vitamins and trace minerals to work with her enzymes and hormones, plus a consistent supply of water, calories and nutrients. Good nutritional status means that her supplies of endogenous (within her body) and exogenous (coming from outside her body) water, calories and nutrients will meet her nutritional needs during ovulation, pregnancy, and egg-laying or parturition (birth). Key to nutritional status is your chameleon's lean body mass. Her body is made up of bone, fat, water and other stuff. It is the other stuff, termed lean body mass (LBM), that represents her organs (liver, kidneys, ovaries, lungs, brain, etc) and skeletal muscles. Let's say your chameleon weighs 60 grams. If she is too thin, she'll have proportionately more bone and proportionately less fat and LBM. If she is too fat, she will have proportionately more fat and moreover she will have proportionately less LBM. Adequate LBM is necessary for successful breeding. It can be estimated by a technique called body condition scoring, introduced later in this article. Nutritional assessment is made by a variety of techniques in veterinary patients - unfortunately, most of these methods have yet to be adapted and standardized for chameleons. For example, machines have been used in other animals to measure body fat. From this data one can then calculate LBM and thus obtain a measure of the patientps nutritional status. Specific physiological equipment measures oxygen consumption and from this data one can estimate metabolic rate and hence daily calorie needs. Neither measure is used in clinical practice for chameleon patients. Laboratory testing holds promise for assessing body condition. For example, plasma triglycerides correlated positively with body condition in female garter snakes (Thamnophis sirtalis parietalis) emerging from hibernation. For non-hibernators such as chameleons, triglyceride concentrations will be less useful. Laboratory data such as low concentration of serum albumin may suggest malnutrition, but generally the markers of poor nutritional status that are measured in other species, such as transthyretin and retinol-binding protein, are not measured in chameleons. We can weigh our chameleons for nutritional assessment, however ideal weights have not been established for chameleon species. This leaves diet history and body condition assessment. Of these methods, body condition evaluation is likely to be most convenient and effective. Chameleons in optimal body condition demonstrate muscle and fat over bony protuberances. Vertebral processes, and the brachial (shoulder) and pelvic girdles may be palpated but not readily visualized. Ribs may be palpated and visualized for some species but should maintain a cover of 1 to 3 mm of soft tissue (fat and muscle). There should be an absence of skin-folds running along the trunk. Optimal body condition varies in appearance between species. For example, adult Parson's chameleons look as if they're wearing a muumuu. Male veileds, in contrast, are naturally leaner and lighter boned. Although we don't have controlled data for ideal body weights, routine weighing is useful for determining degrees of weight change. Following mammalian guidelines, action is taken when a chameleon loses 10% of its body weight acutely (within a week or two, for example) or 20% chronically (over 3 weeks). Actions to take include a close examination of the chameleon, review of recent husbandry, detection of changes in the environment and often a visit to a veterinarian experienced in chameleon medicine. Whatever the cause of the weight loss, breeding should be postponed. Weight loss for any reason always includes loss of vital protein (along with fat), and the lost protein means a nitrogen deficit and loss of cell and organ function. It's no time to be burdening your female with the stress and metabolic demands of breeding. Until we have more controlled data, we recommend breeding females when their body condition score is "3" or "4". If worried about those 4s, remember that the female reproductive hormones are derived from fat substances, and that a moderate amount of fat storage helps sustain the female during gestation. Her ova are already formed and limiting calorie intake at this time only throws her into debilitating negative nitrogen balance. It happened! Your female was bred. Now what? This is a wait-and-see time for you, but for your female there's much to do. If the breeding was successful, the embryos will develop from one cell to several cells to many cells. Still practically invisible to the unaided eye, the embryo is receiving its life-giving nutrients from the mother via the yolk contents. Then the embryos will pass through the shell gland --- a time of high calcium demand --- and not long after the eggs will be laid. Feeding during this time centers on maintenance of calorie intake, provision of nutrients to balance the calorie intake, and minimizing stress. My preference is to maintain or increase food intake in early gestation, to better support the female in late gestation. I switch from feeding every second day to every day. I try to balance prey offered between the usual routine fare (crickets, flies, superworms) and the less common (isopods, snails, mantids, grasshoppers). I lightly dust prey daily with our Walkabout Quantum Series dusts, but to avoid overdosage one must use a dust formulated to be used in this way. If most of the over-the-counter products were used daily, overdosage would result (the specific offending nutrients vary with different products). There is an increasing body of evidence that feeding for longevity is contraindicated if feeding for reproduction. The early work on calorie restriction and longevity in rodents is well known (less well remembered is that the calorie-restricted, long-lived rats were in foul moods, angry and morose). A current hypothesis (termed the disposable soma theory) is that long-lived animals invest more effort into maintenance of their bodies, whereas shorter-lived animals invest more effort into reproduction. Studying skin cells (fibroblasts), scientists from University of Manchester (UK) found that long-lived species were more resistant to stressors. Food-restricted animals show elevated stress response mechanisms. They hypothesize that responses to food restriction is an evolutionary adaptation in certain species that excel at soma (cell) maintenance (Kirkwood TL et al. 2000. Evolution, stress, and longevity. J. Anat. 197(Pt 4):587-590). Current evidence suggests that chameleons fall into the short-lived, high-reproduction group. If this is correct, then chronic food restriction will not prolong life. A confounder is the effect of diet on number of embryos produced, and perhaps the risks of life-threatening egg-binding or dystocia. But I'm getting ahead of myself, and we'll cover this in detail next issue. For now, comparisons between long-lived, underfed rats and your breeding chameleons should be kept to a minimum. Moreover, even if food restriction is found to help reproduction in chameleons, the improvement will be seen at the time of vitellogenesis and egg formation, not post-conception. Feed your chameleon responsibly and well during this critical period of gestation. Consider the importance of temperature on metabolic rates and hence calorie needs. Environmental temperature is one more factor in the equation on feeding gravid chameleons. We have much anecdotal evidence of females selecting warmer sites for prolonged basking. Live-bearers are noted to "belly hug" under basking lights. Little controlled data exist for chameleons, but we can learn from the data collected from other lizards. Scientists in New Zealand studied the viviparous gecko, Hoplodactylus maculatus, with regard to stage of reproduction and selected temperatures. They measured body temperatures in gravid females, non-gravid females and males. Geckos were from two sites – a cool site where geckos reproduced every other year, and a warm site where females reproduced every year. At both sites, gravid females demonstrated highest body temperatures. Body temperatures increased with stage of pregnancy, increasing up to 8C. At the cooler site (with lower reproductive rates), geckos achieved higher temperatures less frequently. The authors suggest that increased body temperature is critical to successful reproduction (Rock J, Andrews RM, and Cree A. 2000. Effects of reproductive condition, season, and site on selected temperatures of a viviparous gecko. Physiol Biochem Zool 73:344-355). When caring for your gravid females, pay special attention to husbandry. Provide optimal temperature gradients with ample areas for basking. As your female warms herself, remember that her metabolic rate will rise, and so will her need for calories. We'll pick this up next issue with the feeding of gravid females at term, egg-binding, and nutrition support. •Breed females with body condition scores of 3 or 4. •Use the window of early gestation to feed for maintenance of optimal body condition. •Reduce stress by feeding at a fixed daily schedule. •Offer a variety of prey to keep intakes high. Use supplementary dust at a schedule appropriate for the product. •Provide extra opportunities for basking, and remember that calorie needs increase as do metabolic rates, in response to warmer body temperatures.